Chord launches Hugo 2 DAC and Poly wireless module | What Hi-Fi? The Chord Hugo 2 is the successor to the Award-winning Chord Hugo. The new model gets a number of major improvements and additions, from extra features to a brand new chassis design. The Hugo 2 boasts the very latest FPGA (Field Programmable Gate Array) technology, loaded with proprietary software designed to deliver the best DAC performance possible. Chord claims the new FGPA and built-in filters help to improve timing, noise, power and dynamic range. The new precision-machined aluminum case gives the DAC a lower profile than its predecessor. You'll also notice the addition of four spherical control buttons on the face of the unit. These control power, input selection, filtering and crossfeed functions. Chord says they've been mounted on top to allow for "future expansion modules", hinting that there could be even more to come from the Hugo 2. The Hugo 2 has four digital inputs, including optical, coaxial and USB, plus Bluetooth. Outputs consist of analogue RCA, plus 3.5mm and 6.35mm headphone sockets. Various hi-res audio formats are supported, including DSD512, also known as Octa DSD. 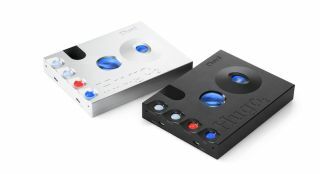 Hugo 2's built-in filter has four settings which allow you to tune the sound, while Chord's Crossfeed system, available on the original Hugo, blends information between right and left channels to move the presentation from the typical 'in your head' balance of headphone listening to something closer to that of a traditional stereo speaker set-up. Battery life is around seven hours, and you also have the option of either a fast or slow charge. The Chord Hugo 2 goes on sale at the end of February for £1800 and we can't wait to get our hands on one! At CES 2017 Chord has also thrown a hi-fi curve ball with the introduction of Poly, a dedicated network module for Mojo, the company's portable DAC. Poly is derived from the Greek word meaning 'many' - a nod to the module's breadth of features. The plug-in module acts as a streaming hub, and you can access music over your home network or from a NAS storage device. There's even an SD card slot if you choose to store your music files that way. There's Apple AirPlay and Bluetooth functionality, while the module supports all manner of hi-res audio formats including DSD64 and DSD512. Power is provided by a built-in battery which Chord claims offers over nine hours of use. Poly will launch in the next couple of months with a price tag of £500. Chord has also launched a new upscaling CD transport, the Blu MkII, which replaces the original Blu. It uses a powerful FPGA core, which can output digital data at 705.6kHz, the equivalent of 16x CD's 44.1kHz sample rate. Chord claims the new FPGA set-up allows for much a clearer and better defined sound. The Blu MkII boasts a more streamlined design compared to the original, and includes a new top plate and display. Connectivity options are AES, optical, and a dual S/PDIF output which can connect straight to Chord's DAVE digital-to-analogue converter. Blu MkII also features a digital input so it can be used as a dedicated upsampler for your digital audio files. The Chord Blu MkII will be on sale by the end of March, priced £7995.